Home › May 2018 | GOATS GALORE! May 2018 | GOATS GALORE! What a sight! Four hundred goats on the hillside. Some on their rear legs stretching up into the live oaks. Poison oak, coyote bushes, and tall grasses are quickly shorn and mown. Sarah Minnick, Vegetation and Fire Ecologist, explains that Marin County Open Space District (MCOSD) is working with adjacent land owners, two ranches and a school, to help mitigate fire impacts. Each of these is using the goat herd to achieve fuel reduction as well as other goals. 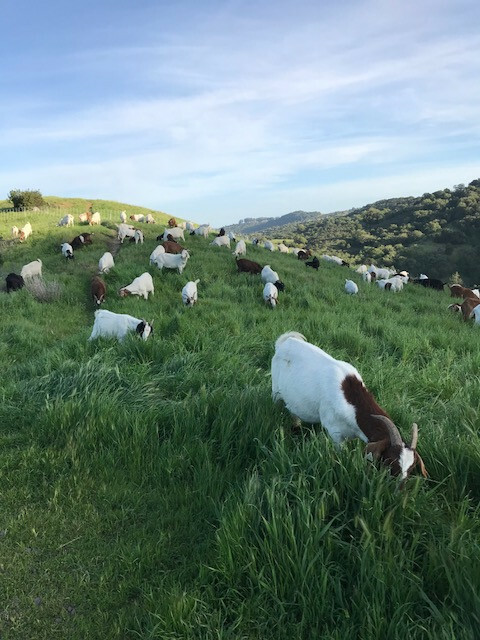 The MCOSD lets the goats browse within 30 feet of people’s yards to give a “defensible space”. They also graze the ridges to prevent fires and enable access for fire-fighters. The goats eat invasive grasses. Native grasses and wildflowers generally benefit from some grazing. In this county, highly invasive barbed goat grass is being contained using multiple techniques. Controlled burns, says Sarah, have proved the most successful, but are difficult to implement. 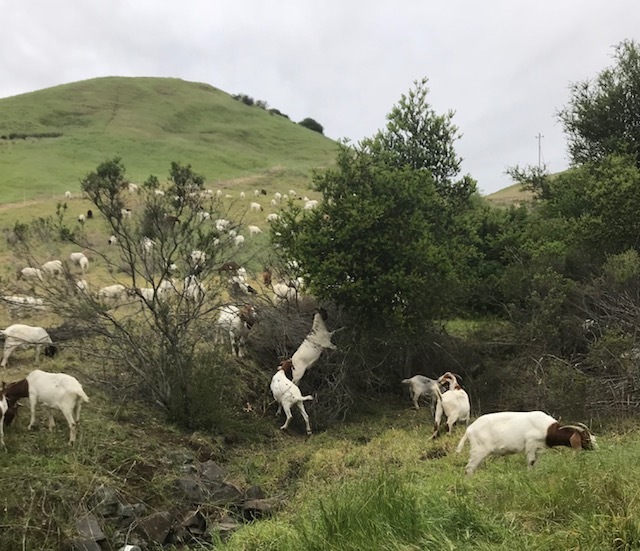 They also use herbicides at different times of year, but are hoping to reduce this over time, thanks to the goats, weed-whipping, and other treatments. Barbed goat grass develops a high silica content as it grows and then it becomes inedible. Catching it early with the goats will allow teams to hand-pull the grass later in the season. Meanwhile, local residents are flocking to enjoy the spectacle. A friend, CarolGriffin, who lives by Terra Linda Open Space, took these photos and a 23 second video of the goats at this link. “There are a thousand ways to kneel and kiss the ground!” (Rumi). We are currently accepting submissions of your Earth-Love experiences to be published in an upcoming issue. Perhaps, you could take 5 minutes to jot down one of your experiences or send a photo with a short commentary to this link. Thank you so much. 1 Behold, thou art fair, my love; behold, thou art fair; thou hast doves’ eyes within thy locks: thy hair is as a flock of goats, that appear from mount Gilead. 8 Come with me from Lebanon, my spouse, with me from Lebanon: look from the top of Amana, from the top of Shenir and Hermon, from the lions’ dens, from the mountains of the leopards.